LinkedIn is very different when you compare it to the other Social Media platforms such as Twitter and Facebook (and others). LinkedIn is the platform where you don’t have that level of anonymity, like you can have on Twitter say, so what you say on LinkedIn can have real weighting on you as an individual. This may sound a bit intimidating, but it’s fascinating if you really think about it. 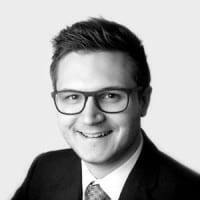 I remember before leaving university that I had dipped into LinkedIn and had set up a basic account with a profile picture and my skills but I never really took it any further. Little did I know at the time, that there was a vast world out there where professionals, old and young were connecting to grow their businesses and personal profiles. 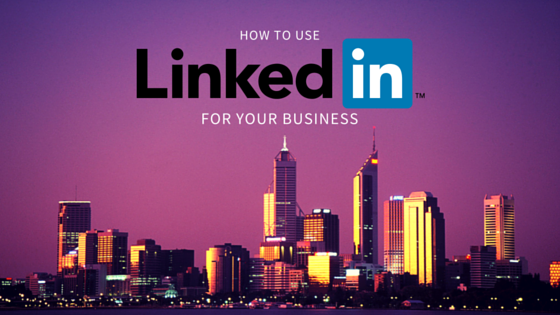 So what can you do to start your journey and use LinkedIn effectively for your business? I know I know, not another crusade about strategy…let’s call it ‘purpose’ instead. So for what purpose are you using LinkedIn? Are you simply putting yourself out there to be found? Maybe you’re recruiting employees for a new position at your company, or perhaps you’re looking to reach out to prospective businesses and grow your stature in your local network. There are a number of reasons you need to define which purpose you want to pursue. Take a look at Alex’s blog on Strategy to learn how to set an objective for your business. Remember that there is SEO value in your LinkedIn page. This is because, like everything, Google searches far and wide for every possible page that’s out there. So, if Google is searching for your LinkedIn page, what phrases should you be using to help Google find you and put you near the top of search results? Here you should be thinking about words that describe your business. 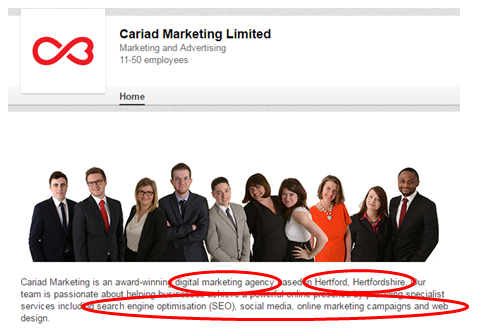 So for Cariad, “Digital Marketing”, “Hertfordshire” and what our services are will be all crucial to bring in here. This might seem obvious and if you’re already doing this, great! Don’t stop. But this applies to your personal profile as well. When talking about your role or your skills, always treat this as an opportunity to strengthen the SEO value of your account. Make sure all your employees follow and share your company’s profile. If you imagine that each of your employees has around 100 unique followers, if you have a team of 10 people then you’re looking at an audience of 1000 people, if not more. There’s an excellent tool to see how your LinkedIn profile ranks against your other connections based on profile views. This will let you see how interesting you are to other people (because not everyone uses LinkedIn as a recruitment channel). If you find that you’re in the bottom half of your connections for profile views why not shake things up a bit? Look at the profiles of say, the top 10 and see what they’re doing that you aren’t. This is of course subject to industries and roles, so you must take it with a little pinch of salt, but the principle remains the same. This is what many people believe to be the most important part of any marketing activity. Without great content why are people going to engage with you? There are two things you should really pay attention to when aiming for great content: an easy to read, free-flowing writing structure and an interesting or unique topic. You don’t need to post content that is always relevant to your industry of work. Take the photo above as an example. We always say “people engage with people”. If what you’re posting is giving off that faceless corporate image then try livening up your business page with a photograph of the team to show how proud you are of them or just say something about celebrating another fantastic week in the office. After all, just because LinkedIn is a business network, it doesn’t mean you can’t post something fun from time to time. There are a lot of people out there who’ll exploit the lack of face to face contact for their benefit. But if you want to get the most out of LinkedIn then you should treat it like an expansion of your own personal network of contacts. I don’t usually add people to my network unless I’ve met them or know someone who does – think about why would you add them, what benefit does it have? Also think about the other side of the equation, what are you bringing to the table? If you want people to start engaging with your page and your profile, the best thing you can do is be proactive, seek out and communicate with those communities first. Once you start sharing your opinion on trending articles and topical debates you’ll find that people who agree with you will look at your page where they might engage with other posts or recommend you to friends/colleagues. This is only a brief look at how you can you can use LinkedIn, so if you have any questions or any thoughts you want to add to this blog, leave a comment below and we’d be happy to discuss. 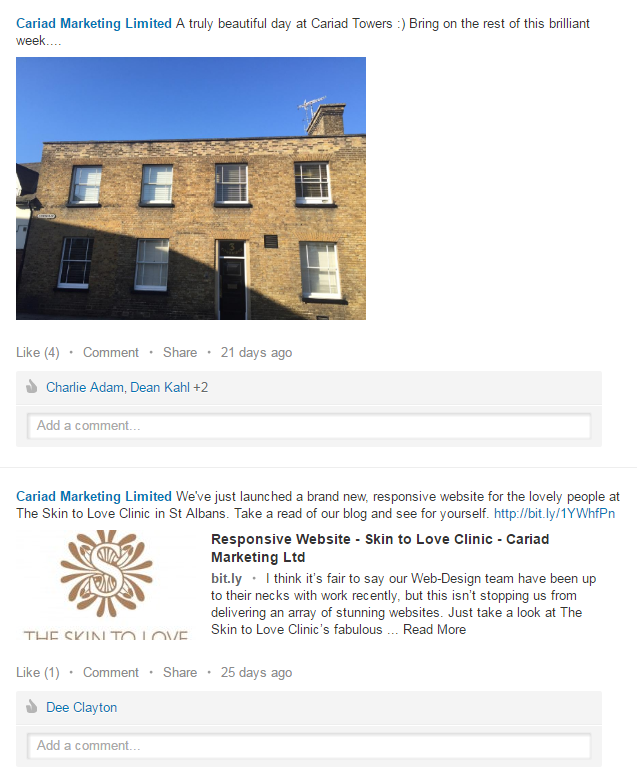 Or if you feel like you want to be on LinkedIn but can’t give it the time and attention it needs, you can always speak to the team on 01992 582 824 or email welcome@cariadmarketing.com and we can talk to you about how we can help achieve your business objectives.